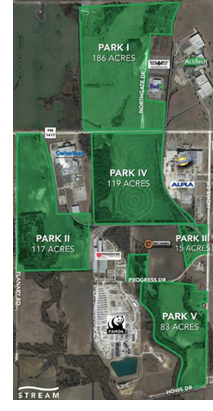 ​​ SHERMAN – The Sherman Economic Development Corp. (SEDCO) is adding to the city’s Progress Park industrial area with the close of a 63.6-acre land purchase just west of the Panda Power plant. The SEDCO board of directors voted to purchase the nearly 64 acres of land for $450,000 in September 2017. The land will also be accessible by the city’s Progress Dr., which currently dead-ends near the northeast corner of the land. SEDCO staff said the new purchase is part of an effort to acquire more land to market to companies looking to relocate or expand in Sherman. In addition, SEDCO board also has approved the sale of 22.5 acres of land in Progress Park IV to FedEx Freight for a planned local expansion.